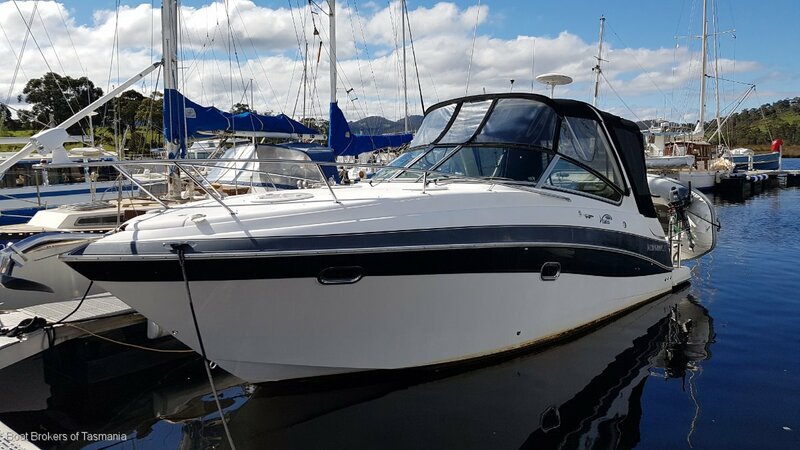 This boat really performs and is a comfortable weekender for 2 or 4 with quality inclusions and 2 seperate double beds. A fully covered cockpit means it can be used all year round and with only 40 hours usage on the engines professionally fitted in 2016 this is a turnkey boat ready for summer. With a comprehensive inventory and late model engines this vessel represents excellent value. Please phone Steve Taylor on 0400 934 974 to organise an inspection. Genset 240 volt shore power and a 2000 watt inverter. Galley Microwave and electric single burner stove. BBQ on stainless steel rail. Refrigeration 12/240 volt in galley and an ice box in the cockpit. Toilet Electric with holding tank, vanity and shower. Ground Tackle Plough anchor with chain with remote controls to helm and foredeck control too. Electrics 12 volt system. 2000 watt inverter and extra batteries fitted. 6 in total. Deck Gear Stainless steel swim platform rail.